If life in the city is getting you down, grab a fresh air fix in Slovenia where medieval castle towns nestle beside tranquil lakes at the foot of picturesque mountain ranges. 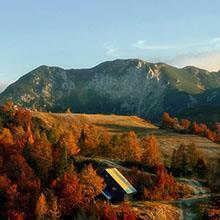 Slovenia is the perfect place to switch off the stresses of urban living. If you're not in the mood for relaxing, you can enjoy the scenery with more adrenalin-fuelled pursuits like caving, canyoning, mountaineering and white-water rafting. Or, you could just wander the gorgeous old-town streets in the capital Ljubljana, or visit equally lovely towns such as Ptuj and Piran, and take life easy for a change.